Distributing HDMI signals in a retrofit situation is often a difficult task since the only real cost effective option is to run cat5e/cat6 to a location and use a Cat5e HDMI Extender. That solution requires you to fish new cables (some cases 2 cat5e runs) as most homes do not have Cat5e cables in locations where you need a display. Vanco has announced a new HDMI extender that uses a single coaxial cable (this is your typical CATV cable). That’s right! 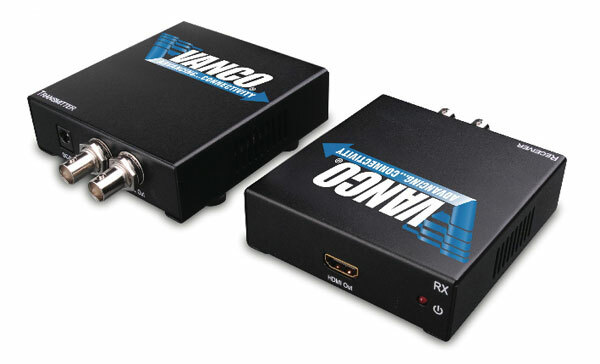 It allows both HDMI Audio/Video signals to be transmitted using one coaxial cable. The transmission range for 1080p resolution is up to 328 ft (100m) over RG-6 coaxial cable (dual and quad-shielded) and up to 164 ft (50m) over RG-59 Coaxial Cable. The transmitter and receiver units can connect to two flat panel displays and up to 45 receiver units can be cascaded from one transmitter to connect to additional flat panel displays. This product is a custom installers dream device and a must for any retrofit project that requires HDMI distribution when only Coax cable is available. For more information and to locate your nearest distributor please visit Vanco’s website.